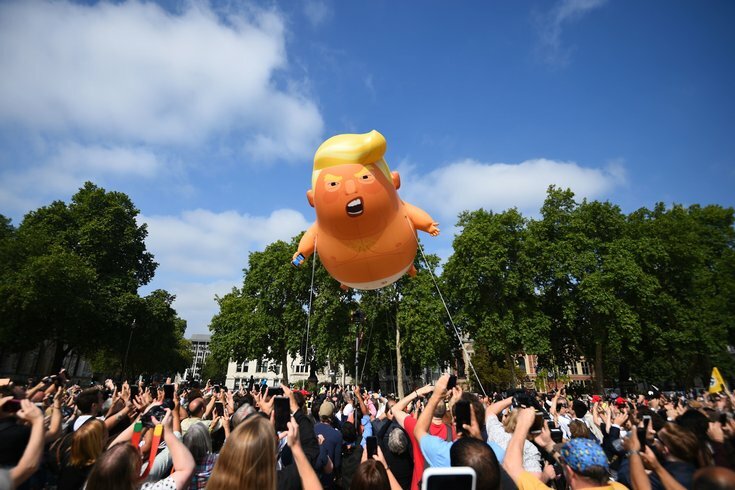 Six inflatable versions of the president have come from the U.K. to be distributed throughout the U.S.
A 'Baby Trump' balloon rises after being inflated in London's Parliament Square, as part of the protests against the visit of US President Donald Trump to the UK. Activists in New Jersey have raised funds to bring a Baby Trump balloon to the United States. The infamous Baby Trump balloons arrived stateside this week and are reportedly embarking on a tour starting next month. The first of the balloons did a test flight in Califon, New Jersey, on Monday. It was paid for by a GoFundMe that raised $24,000 to bring the balloons, originally seen in the United Kingdom during President Trump's visit last month, to the U.S. Activists Jim Girvan, organizer with Bedminster protest group People's Motorcade and Didier Jimenez-Castro set their campaign goal at just $4,500, but in the month the campaign was live, the fund reached nearly $24,000 from about 1,000 donors. Now, there are six Baby Trump balloons up for adoption. As of Wednesday, 16 people had applied from 10 states, according to the Bridgewater Courier News. The float – seen in the above video of it's test run in Jersey on Monday afternoon – depicts President Donald Trump wearing nothing but a diaper and a scowl, holding a cellphone. The original blimp made its first appearance back in July, flying above Parliament Square in London. An estimated 250,000 people protested the area during Trump's visit. Baby Trump then followed the real Trump to Edinburgh for protest that drew about 10,000 people. Organizers have not announced yet the official event to release the prop here in the U.S., but they said they hope one will go up in the next three to four weeks in Jersey. Girvan said he wants one to fly in Bedminster, where Trump comes to play golf, before the November midterm elections.